Van rentals, convertibles, luxury cars, SUVs and sports cars are some of the most popular & highly rented categories at the Miami International Airport. Rent a car for Miami International Airport in just three quick steps - search, compare, reserve! Cancel your Miami International Airport car rental for free, up to 48 hours before the pickup time. Car rental at Miami international Airport (MIA) is a convenient means of commuting from this airport to the city. Miami airport is located in the beautiful city of Miami, also known for its nightlife, party ambience and cuisine. We give you quick and easy online booking for Miami International Airport car rental deal and are in association with leading suppliers like Sixt, Alamo, FOX USA, Dollar, Enterprise to name a few. Whether you are travelling alone or have group of friends with you, our Miami International Airport car rental service comes with an excellent range of small and high end cars to choose from. MIA is the major airbase serving entire Florida’s southern area. It is about 8 miles away from the northwest of Miami and is a major hub of the city with numerous flights to all the important destinations in the world. The airport is located in the prime location between the major cities of Hialeah, Miami Springs, Miami, Virginia Gardens and Doral, which is why travelers prefer to rent a car at Miami International Airport to commute to these nearby cities in comfort. It is one of the most important centers between the US and the Latin America. The well developed avenues and the amazing local economic increase helps in maintenance of the airport and thus large revenues are also generated of it. The Airport has some of the most significant flights that connect the South American nations to the US destinations. This airport is an ideal location for the traffic exchange between the European, North and South American air space. When it started in 1928 it had only few P AN American field and was a base for the American Airways. Presently it is one of the most well facilitated airports which have amazing public transports system and also commuting provisions. The airport is quite famous and has been featured in a lot of video games and the movies and television series etc. Cars hire at Miami International Airport with us means luxury of driving around in Miami, at your own convenience. Wi-Fi service – Consisting of many WI-FI zones, MIA gives its travelers a free access to travel related sites. Gift shops – Indulge in some shopping from the multiple gift shops selling souvenirs, jewellery and perfumes. Restaurants and cafes – Sample some lip smacking food from the many dining options that range from sophisticated restaurants to fast food joints and cafes. Currency exchange and ATM’s – MIA has many ATM’S and currency exchanges located on the 2nd and 3rd levels of its premises. Interstate 95 This route is used for traveling to Miami and Broward County. 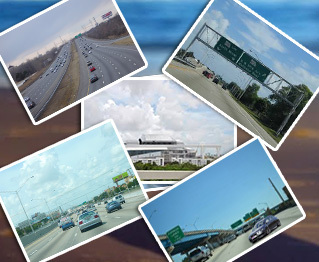 Airport Expressway (SR112) The highway has pleasant roads and runs from I-95 to Miami International airport. Palmetto Expressway(SR826) The road runs from Kendall to North Miami Beach. Dolphin Expressway (SR 836) This route runs from Downtown Miami to Sweetwater leading to Florida’s Turnpike.